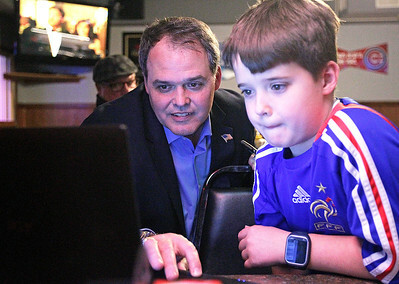 H. Rick Bamman - hbamman@shawmedia.com McHenry County States Attny candidate Daniel Regna and his son Bryce Regna watch results come in on Tuesday, March 15, 2016 at Sammy's Bar & Grill in Huntley. Daugher Anna. H. Rick Bamman - hbamman@shawmedia.com McHenry County States Attny candidate Daniel Regna speaks with supporters while waiting for election results on Tuesday, March 15, 2016 at Sammy's Bar & Grill in Huntley. 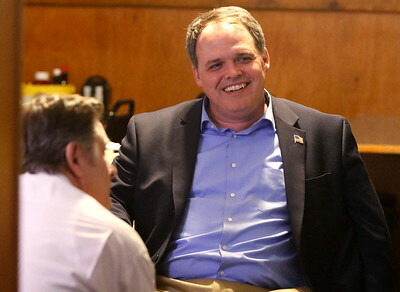 McHenry County States Attny candidate Daniel Regna speaks with supporters while waiting for election results on Tuesday, March 15, 2016 at Sammy's Bar & Grill in Huntley.